1 of 3 Heat oven to 400 degrees . Place almonds in a food processor; process until finely ground. Add flour, 1/4 cup of the sugar, the butter, egg yolk and salt; pulse until butter forms coarse crumbs. (If it seems too dry, add 1 tbsp cold water.) Press mixture into a 9-inch tart pan with a removable bottom. 2 of 3 Toss plums with remaining 1/4 cup brown sugar and the lemon zest. 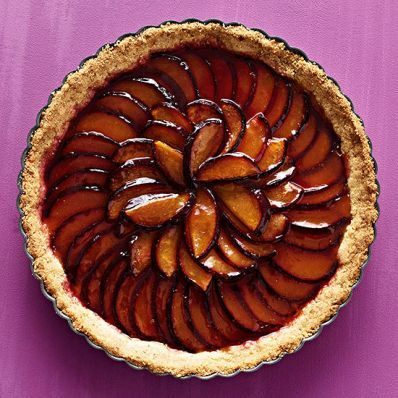 Arrange in the tart pan in 3 concentric circles, alternating the direction of the slices with each circle. Bake at 400 degrees for 40 minutes on the middle rack, until crust is lightly browned and plums are tender. 3 of 3 In a small bowl, combine apricot preserves with 1 tbsp. water; brush on plums. Cool completely on a wire rack.